This is an Airtronics MX-V 3-Channel 2.4GHz FH2 Digital Pistol Grip Surface Radio System with Waterproof Receiver. Sanwa put the most important functions of a modern transmitter in a new ergonomic design with fast radio response thanks to FH2 2.4GHz technology! The MX-V's user-friendly menu features easy-to-setup functions and a sensational price to performance ratio. With this transmitter, every R/C driver gets all the decisive features in a case design similar to the high-performance MT-4. This version of the MX-V comes with a 3-Channel 2.4GHz FH2 Waterproof receiver, but works with ALL Airtronics FH2 2.4GHz surface receivers. 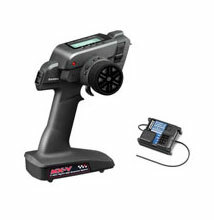 This guarantees interference-free R/C boat fun, great range and fast transmission of the signal. The 10-model memory with model naming allows an easy and quick change between your models. The complete setup works via the multifunctional display. All important functions are arranged intuitively and can be reached without any problems even with small hands. Light weight, affordable price, simple menu system, the right features, fast response and now a waterproof receiver - All the things you'd expect in a much more expensive setup. The Airtronics MX-V is the ultimate RC Boat enthusiast's sport radio.